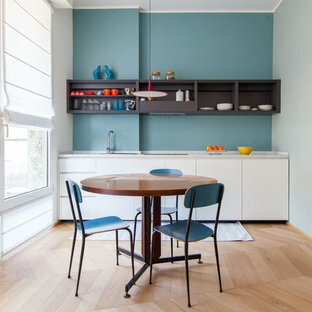 Scopri su Houzz la più vasta collezione di foto e idee per: Tenda da cucina. Sfoglia 839 foto sul tema e lasciati ispirare per il tuo prossimo progetto. This spectacular new beach kitchen was designed for an older couple with the love of the water in mind. The house is not large but the client wanted the kitchen area to be the main aspect of the design and to be comfortable and serene.The windows were optimized for the maximum view from the eat in kitchen area. The large island was designed for grandchildren to enjoy and to use for buffet dining when cooking outside. The laundry also is a “prep” kitchen that has an additional refrigerator and is where small appliances are stored on the counter to keep the main kitchen counters clutter free. The client asked for a fun seaside kitchen with a neutral backdrop of cabinetry so she could showcase her colorful accessories. We chose classic white cabinetry to complement the maple floors and selected soft white for the wall color to keep harmony with the incredible views. She wanted a no fuss kitchen with lots of counterspace for multiple cooks when her adult kids came to visit. Her husband requested a no or low maintenance countertop as well so we chose a ceasarstone top that mimics traditional carerra marble but without the associated issues with marble tops. To emphasize the beach living atmosphere, we chose a glass that has a slight frosted wave in it and then turned it sideways instead of the traditional vertical application. The knobs and handles are a mix of traditional and modern and are satin nickel to match the sink and faucet and appliances. 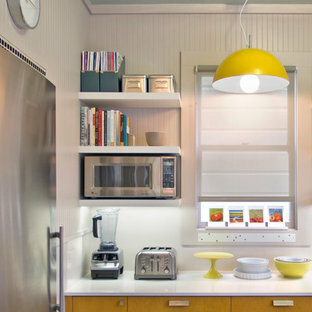 In addition to the large laundry space, one wall is dedicated to storage and features pullout drawers and houses the microwave as well. 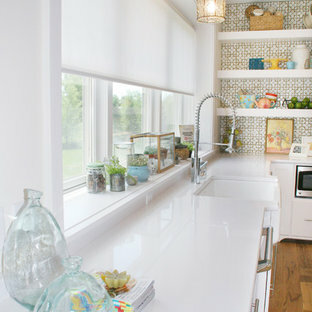 Small details such as the open shelf under the upper cabinets to showcase colorful pottery and the wine grid help give some dimension the upper cabinetry. 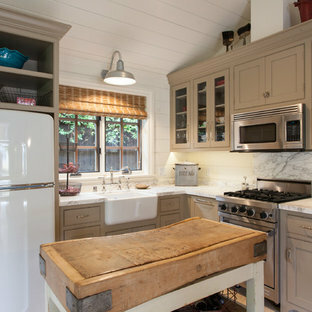 Warm, transitional kitchen with clever storage features. 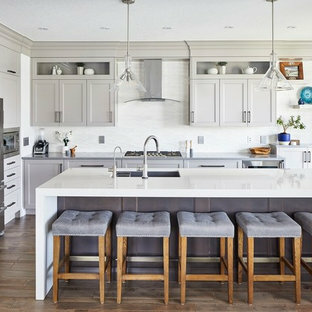 The complete look of this large kitchen is nothing but perfect! 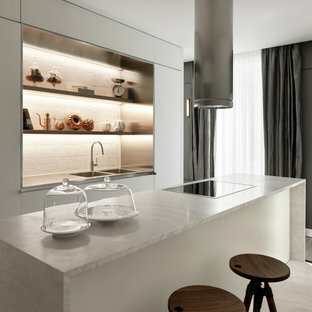 Each drawer, cupboard, appliance, and decor is placed in such a way that is function and design worthy. Learn more about this kitchen remodel at the link above. 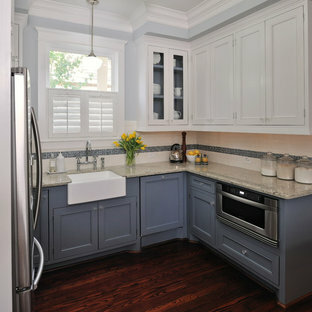 Email me at carla@carlaaston.com to receive access to the list of paint colors used on this project. Title your email: "Heights Project Paint Colors". 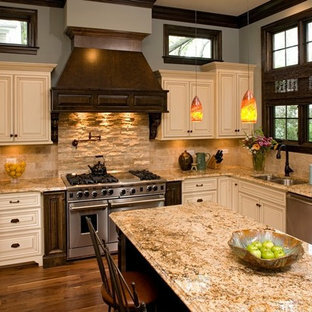 Kitchen for clients who love to cook!